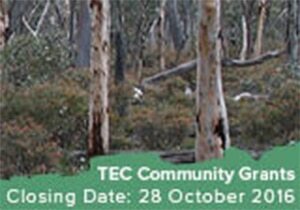 Funding is available through the Australian Government’s National Landcare Program to protect and maintain the Eucalypt Woodlands of Western Australian Wheatbelt, a National Threatened Ecological Community (TEC), within the Peel-Harvey Region. Funding is available to support farmers, landowners and Local Governments to undertake on-ground works within the Hotham-Williams sub-catchment (see Map). mature trees that have a diameter, at breast height, of 30 cm or more, and contain hollows. For further information or to discuss your eligibility, please call PHCC’s Mel Durack on 0455 166 780, Wednesdays and Thursdays, or email hotham-williams@peel-harvey.org.au Application form can be downloaded here.